Based on the Bavarian innovation leader BMW i8, Gabura Racing Technologies GmbH (GRT) is developing an astonishing supercar. This is a technical demonstration of our Munich-based company to highlight the unique know-how and passion of the team. All our experience is concentrated into this street-legal super sports car: the engineers turned the concept “upside-down” and instead of the hybrid, the GRT V8i is fueled with racing technology. The 4.4 liter, twin-turbo V8 from the actual BMW M-series has been implanted in the front. Our engineers designed a high-performance motorsport cooling system and a dry sump lubrication for the engine, therefore it could be installed as low as possible, which is a benefit for the car’s center of gravity. The most noticeable feature, highlighting exclusivity at the back are the huge exhaust end pipes of the lightweight titanium exhaust-system. For the ideal weight distribution, the 6-speed sequential racing transmission and the robust differential are positioned at the rear axle – transaxle layout. The all-new, high-performance suspension architecture is track racing proven as well. 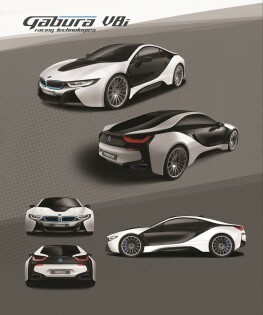 There is an enormous hype around the high-tech and exclusive BMW i8, mostly because of its super-cool design. This is why Gabura Racing Technologies wants to stay close to the original shape, but as the GRT V8i is going to be more powerful and purely rear-wheel-drive, the design team had to make it wi(l)der. To underline its exclusivity, the GRT V8i will be built on demand in a limited edition series in Munich. Follow us and the latest development steps on Facebook, YouTube and Twitter. If you are interested in custom build, exclusive sportscars/racecars, do not hesitate to contact us.